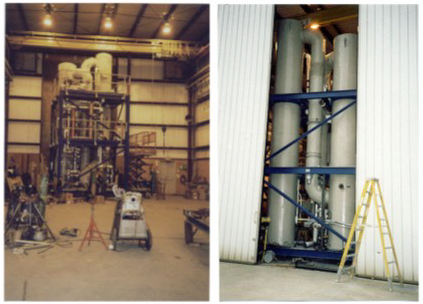 Branch provides custom built Air Stripper units for removal of voc, ammonia, hydrogen sulfide and other volatile components from water. With our experience in complete systems, we can provide you with all of the related components and controls for a trouble free installation. Counterflow stripping columns are the most common design because of the high efficiencies that can be achieved, combined with the low air volume required. Air volume is important, because in many cases the air will require further treatment before it can be discharged. The smaller the volume, the lower the supplemental equipment cost. We offer designs using any of the available component suppliers. If you have a specific preference, we will be able to help you. Where ammonia is present in water to be treated, you can remove it using air stripping technology. By a combination of pH adjustment and temperature, we calculate the tower size for any required efficiency. The most common application is for waste water at ambient temperature. By increasing the pH to 11, removals in the 80-90% range can be provided. With large systems, the discharge air will need treatment to collect the ammonia. We provide a closed loop system where the discharge air is treated with an acid wash to form a salt from the ammonia and the air is reused in the stripper. Carbon dioxide, hydrogen sulfide and other soluble gases can often be removed using air stripping technology. We have previously built units for many unusual applications .Recently, several units have been installed on MTBE. Information on stripping MTBE or other VOC compounds is available.